Do you remember the Ice Bucket Challenge? Last summer, millions and millions of people jumped at the chance to dump ice chests, buckets and barrels of ice cold water on themselves, and then challenge their friends to do the same. Social media was saturated with photos, videos and testimonials. 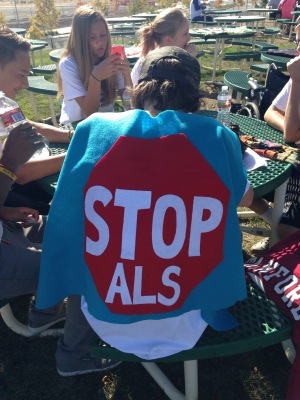 The Ice Bucket Challenge was created to raise awareness about ALS, also known as Lou Gehrig's disease. In several months, millions of dollars were raised to fight this horrible, terminal disease that has no treatment or cure. In other words, ALS is a death sentence -- and along the way, the sufferer's body will slowly lose all ability to move. I have a friend who has ALS; actually, I met her through my son. Her name is Cathy Speck, and over the last two years she has taught both of us about life and love while she is dying. You might remember her from the story I wrote last fall about the ALS walk we did together, or the Christmas caroling party she organized. Everyone loves her-can't you tell? Nadine El Khoury created this video short about Cathy -- and she is also the director of Better Days, a documentary she has written, filmed, directed and is producing to share awareness about ALS. Through a strange twist of fate, she found Cathy's song, "Sweet Beyond", online, not knowing Cathy suffered from ALS, too. Cathy and Nadine became fast friends and a few weeks ago, my son and I attended a fundraising event to support Cathy and help raise awareness for the documentary project. There was no ice bucket, and we weren't asked to do anything except listen to stories and watch a video trailer for a documentary trying to get finished. I spent two hours shifting between tears of laughter, sadness and hope, but I left feeling full of love. Nadine's documentary has captured the essence of ALS: how it strikes at random, often swiftly and without warning, and leaves its victims living a life they never imagined. You may not know anyone with ALS. You may not want to know about this disease, or how devastating it is. You may not want to think about things that are so frightening or painful or things that could actually happen to you. But if you've taken the time to read this post and watch these videos, you know Cathy. And I promise you -- you would love her, too. So I have a favor to ask you. Did you do the Ice Bucket Challenge? I promise you, my request is much, much easier. In our little town, at our little fundraiser, we gave over $4,400 towards helping get this documentary finished. This movie isn't for profit -- this is a project created by one young woman from Lebanon who had a friend develop ALS who is using her talents to spread the word about a disease. This is from one dying woman who lost her mother, two brothers and an aunt to ALS, and is living more gracefully than many. This is from one mother who has watched her teenage son befriend a woman who is dying, and has seen him enrich his life from knowing her. This is from one writer asking you to be grateful for your health, and to share what you can to get this film finished. To find a cure for this disease. To learn more about the "Better Days" documentary project, click here or visit Nadine's Facebook page. To watch another trailer for "Better Days", click here. And please share this post on your social media. Tweet, Facebook, and Google+ this to help us spread awareness about ALS, about "Better Days", and about Cathy.